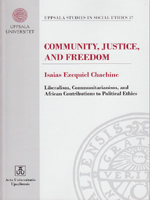 This study deals with theories of community, justice, and freedom within liberalism, communitarianism, African philosophy and theology. One thesis is that different theories of community, justice and freedom are informed by particular moral experiences with bearing on different views of human. Theories of justice and freedom within political philosophy are related to different understandings of the relationship between the individual are the community.